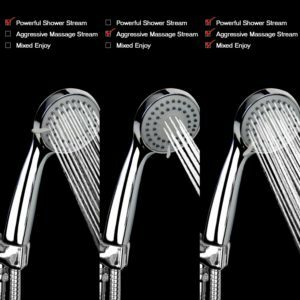 Best 3 Metal Hand Held Shower Heads – Quality & Durability & Options! 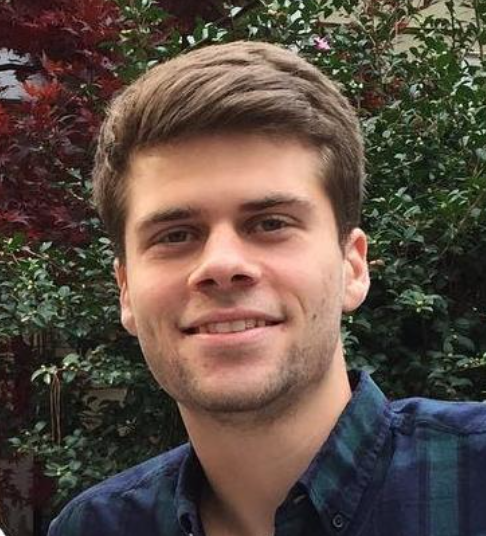 Last Updated: March 24th, 2019 We’re all busier than ever. With so many commitments in work and at home we need a place we can escape it all. For a lot of us it’s the 15 minutes a day in the shower where we can really unwind and relax. In the modern era the showering experience has never been more crucial to our daily life. 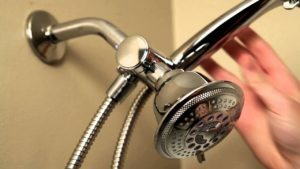 In this Best Metal Hand Held Shower Head guide you will learn about the different types of metal shower heads, what you should look for in these shower heads, and which ones are our favorites! 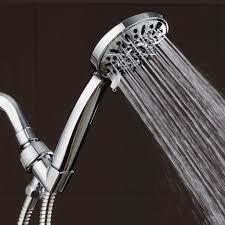 The shower head is the most important aspect of the shower. It helps regulate the water flow, keeping the spread of water evenly across your head and body. It can also have an impact on the cleanliness of the water and even the temperature. If you are interested into one of the best shower faucets possible then check out our faucet reviews page, or check out our Grohe Shower Faucet review! 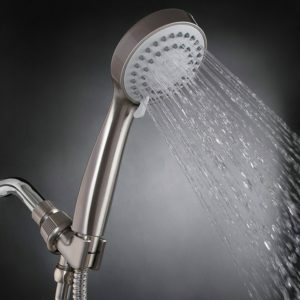 When choosing a shower head there are a number of options. You can go for a mounted unit but increasingly people are appreciating the benefits of a handheld shower head. This allows for much greater versatility and reach when you’re showering allowing you to get a deeper clean. Speaking of clean, if you are interested in keeping your shower clean then look at a fiberglass cleaner! Ther material you choose also has a big impact. While plastic can be cheaper you’ll want to try and find a metal shower head. Metals like chrome or steel can really add to the lifespan of your shower head and protect it from rust or dirt that can build up. Plus metal offers a classic, stylish look so your shower looks as good as it feels. There’s a lot of choice when it comes to shower heads and that’s why we’ve identified our top 3 hand held metal shower heads which are providing incredibly popular everywhere. Now this isn’t technically just a handheld metal shower. It’s actually a combination of a fixed shower head with a handheld attachment. Nevertheless this is one of the most impressive products on the market and is offering a fantastic shower experience for it’s users. It’s been designed to be intelligent and effective. You can use both shower heads at once or just use the handheld element while showering. It’s easy to fit and simple to clean so you can focus on using the product rather than installation and maintenance. There are 24 different water flow options available with this shower head. This means you have full control of the pressure and spread pattern of the water, allowing you to shower your way every day. The Hydroluxe shower head offers a consistently strong flow of water without any dips in pressure. 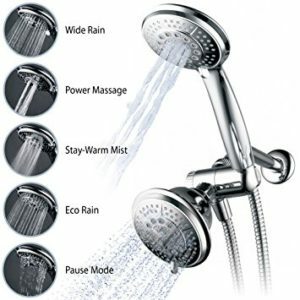 There are also 5 different preset settings you can choose from with this shower head: Power Rain, Massage, Stay-Warm Mist, Water-saving Economy Rain and Pause. Each of these offers a different sensation and can help you relax after a stressful day. With a really long hose the Hydroluxe handheld shower head can stretch a long way. It’s perfect for getting you clean all over with maximum versatility. The Hydroluxe shower head is built with rub-clean jets. This means a single wipe with a cloth or towel will let you clean the nozzles and keep the whole shower head working perfectly. Hydroluxe stand behind the durability of their product by offering a 10 year warranty. This can give you peace of mind that if anything does go wrong you can simply replace the product. The Hydroluxe handheld shower head is made entirely from chrome which offers long term protection from any damage or rust. It’s also one of the most stylish units available from the shower head to the hose. Affordable and effective, the Hydroluxe is one of the best handheld metal shower heads around. The YOO.MEE high pressure shower head is offering a lot more than the competition with built in advanced technology ensuring a superior showering experience. Made entirely from luxury polished chrome and made to be stylish it’s one of the best looking shower heads on the market. YOO.MEE are an American brand who are fairly well known in the industry. They specialise in creating innovative products and this is true for their high pressure shower head. It’s been designed to give an even high pressure service even if the water pressure in your home is generally low. For anyone who suffers from low water pressure it’s a Godsend. Pulse Massage and a mix. These all give a different shower experience that is uniquely relaxing and let you shower your way. The even pressure offered by this handheld shower head makes it well suited for dealing any any aches or pains. It goes a long way to easing sore muscles and helping lower recovery times. Built with Upgraded 2XP Turbo charging the YOO.MEE handheld shower head allows you to use less water every time you shower. This is better for the environment but also your bills at the end of the month. YOO.MEE are offering an advanced handheld metal shower head that has a place in every home. 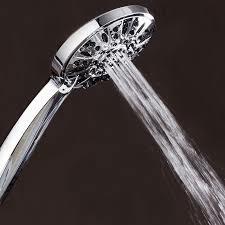 It’s incredibly stylish but also very effective, with multiple settings allowing for the perfect showering experience. It’s also the perfect solution for any households who suffer from low water pressure and lets you enjoy an even and enjoyable water pressure. The AquaDance High pressure handheld shower has been designed by professionals with years of experience in the industry. It too is made entirely out of chrome allowing for easy maintenance and cleaning. Aquadance have created their shower head to give the most relaxing experience possible to the user. They’ve built in 6 different settings to choose from: Power Rain, Pulsating Massage, Power Mist, Rain Massage, Rain Mist, Water Saving Pause Mode. Each of these offers something unique to the experience and lets you customise your showering experience. In a wet shower there’s nothing worse than a handheld shower you can’t keep hold of. Aquadance have developed an ergonomic grip for this shower head which makes it easier to use than a lot of their competitors. You don’t have to worry about spending hours cleaning this shower head, it has a rub clean head which means one wipe and all dirt will be removed. Aquadance clearly have a lot of faith in their products and each unit comes with a lifetime guarantee. This means if anything goes wrong you can easily get a replacement sent to you. Overall AquaDance have made a really effective and stylish handheld shower head. It’s blowing a lot of the competition out of the water with it’s range of settings and user friendly nature. Affordable and stylish it’s one of the most popular handheld metal shower heads out there. All three of these shower heads are extremely popular and the feedback from customers is overwhelmingly positive. They all offer a great deal of value with a number of settings and innovative features built into each to make your showering experience enhanced. On a side note, if you are interested in an easier way to clean your showers, then check out our shower squeegee guide! While they are each slightly different in terms of what they offer they undoubtedly will upgrade your shower in some way. If you’re looking for a hand held shower head then these are definitely 3 to check out. If you are looking for another way to spruce up your showering experience, then take a look at a shower head with a speaker!